Called Rimrock Draw, the rockshelter is located near the town of Riley in southeastern Oregon. It is a site where archaeologists have been conducting surface surveys and excavations since 2011, yielding a number of artifacts that suggest human occupation of significant antiquity. The site may date perhaps as far back as the Late Pleistocene Epoch (near the end of the geological period from 2,588,000 to 11,700 years ago) and to the Early and Middle Holocene Epoch (the Holocene beginning about 11,500 years ago). 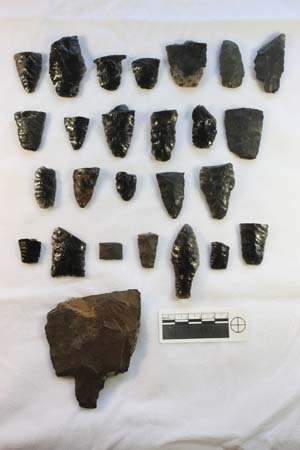 Surveyed initially by the Burns Bureau of Land Management (BLM) and volunteers from the Oregon Archaeological Society, finds have thus far included 26 stemmed points (see below, right), a Black Rock Concave Base point, a crescent fragment, Northern Side-Notched points, biface fragments, including a fluted biface, "overshot" flakes suggestive of Clovis technology, a small number of Elko Series points, and a bedrock mortar. 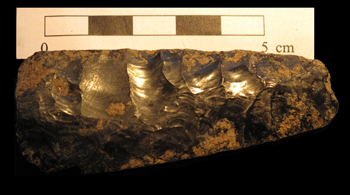 According to archaeologists working at the site, the stemmed points are the dominant group of projectile points that have been recovered on the surface, but the fluted biface, in association with the overshot flakes, is of great significance because it suggests the possibility that at least Clovis-age artifacts might be deposited within the rockshelter. 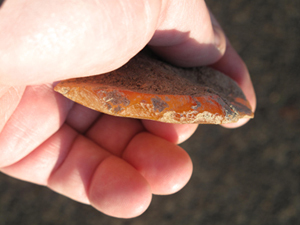 Moreover, the Black Rock Concave Base point (an artifact found in other contexts that date to 10,000 - 12,000 years ago) is considered very uncommon in other locations in Oregon, but comparatively more common in the area around Riley. Further survey and excavations were funded by the BLM state and national offices after the initial discovery when BLM Archaeologist Scott Thomas decided to focus on the rockshelter as a location for studying early Holocene climate change. A crew composed of BLM and University of Oregon archaeologists then dug two 2x2 and one 1x1 test units at the site to assess the potential for understanding climate change issues. Further excavations were conducted, including a 2012 field season. Additional finds at the site included hearth features and charcoal. Report the archaeologists about one find: "The hearth feature contains two charcoal lenses interbedded with fire affected earth. Obsidian flakes are present in the sidewall in both the charcoal lenses and the fire affected earth". Other finds included a mano and a metate, an abundance of more lithic debitage, a scraper, two hammer stones, and a chopper. Also uncovered was a "packrat midden" that, according to the excavators, "holds the potential for producing perishable cultural material". A pair of feathers bound with sinew were found on the surface just below the midden, exposed as a result of a windstorm. It suggests that the midden could yield more artifacts, and archaeologists hope to explore the midden further to uncover more perishable material. The various artifacts have been submitted for analysis, such as protein residue analysis for the lithics, radiocarbon dating for the hearth charcoal, and identification and dating for the feather bundle. "The test excavations at Rimrock Draw Rockshelter were extremely successful in demonstrating how important this site could be to Northern Great Basin Archaeology", reports a project archaeologist. 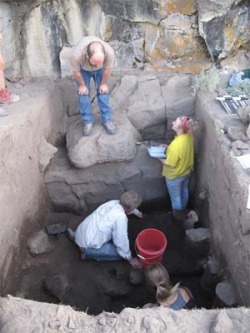 "There is solid evidence for extended habitation of considerable antiquity......."
In the summer of 2013, the University of Oregon plans to run a field school at the Rimrock Draw Rockshelter in conjunction with the ongoing excavations. More detailed information about the discoveries and the field school can be obtained at the project website at http://pages.uoregon.edu/ftrock/.